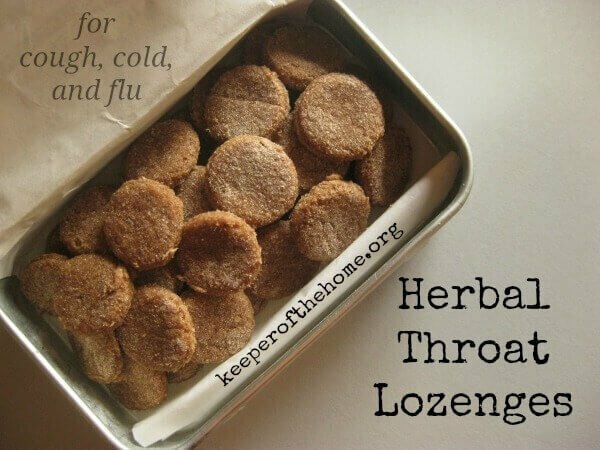 Want to make your own homemade herbal throat lozenges? Today, Kresha has you covered! For nearly two decades, I had a favorite brand of cough drops that went with me everywhere. During that time, I had a pack of cough drops in my purse or in my rehearsal bag (I’m an opera singer when I’m not blogging and mothering) pretty much constantly. Trouble is… I turned the package over a few years ago and realized what was actually IN said favorite cough drops. Needless to say, I went looking for a few decent alternatives right quick. While I loved a few of the alternatives I found, I also wanted to make something at home so that I could control the ingredients. I started with homemade cough drops based off the popular Swiss herbal blend, which worked really well, but it was a bit time consuming, and I wanted something I could whip together in just a few minutes. This homemade version of Slippery Elm drops was just the one-trick pony I was looking for. They take only a few minutes to make, they coat a sore throat well, and due to the addition of elder flowers (read more below), they actually help prevent the flu as well, so take these anytime you feel either the sniffles or a fever coming on. This recipe is remarkably easy and has only about half-an-hour of hands-on time total, but there are few hours of “curing” time, so make sure to take that into consideration. Place the elder flowers and the horehound in a heat proof bowl and pour the boiling water over. Stir to make sure each bud or leaf is moistened, then cover and set aside for about 8 hours or overnight. After steeping, measure out 1/2 cup of liquid, pressing on the herbs. Add water if necessary to make a full half-cup. Compost the herbs. Place the liquid in a saucepan along with the honey. Heat gently just until the honey is melted and you can whisk the honey easily into the herbal liquid. Meanwhile, in a large bowl, mound the slippery elm bark into the middle, then create a well in the center. When the honey-herb mixture is ready, pour it in and stir the mixture until a dough is formed, then mix with your hands until the dough is smooth, adding more slippery elm if needed. The mixture may be crumbly, but should be still be able to be cohesive when pressed together. When the ball is smooth, dust your work surface with slippery elm powder, then roll the dough about 1/8th-inch thick. Then, using a tiny round cutter (I usually use the small bottle cap off a bottle of vanilla extract or similar. Just remember this will be the size you will be putting in your mouth, so keep them as small as possible.) Place them on a sheet of parchment paper. To dry, set lozenges aside for 24-48 hours or place them in a food dehydrator at 150°F for 4-6 hours until completely dry. Once dried, store in an airtight container. It’s a great way to reuse an old metal mint tin if you’ve got one! Store in a cool, dark, non-humid place for 4-6 months. If you don’t have a place that is all of those things, you may store them in the freezer. If you’re in a hurry, you may eat the drops before they’re dry, but – as my three-year-old son is wont to say – they’re more like gum. Horehound is in the mint family, but has a distinctively bitter taste. Its role here is as an expectorant and mild pain reliever. It too is known for its potent antiviral properties. As I wrote in my original cough syrup recipe, honey is soothing, tasty, and coats the throat. Raw honey, especially, is packed with nutrients and enzymes and is a powerful antiviral and antibacterial substance. The beauty of the honey in this recipe is that it sweetens the drops (absolutely necessary with the bitter herbs!). Slippery elm bark powder turns into a sweet, mucilaginous slurry when combined with water and relieves inflammation and irritation in the throat superbly. If you aren’t able to find the herbs for this recipe or want to save a few dollars, you can certainly still still make it with just water, honey, and slippery elm. Just skip the steeping step and dissolve the honey in the boiling water and add to the slippery elm as described. Have you ever made your own herbal throat lozenges? What’s your favorite ingredient to include? Hi! Are these safe for nursing & pregnant mothers? Thanks! 1. I have looked carefully for research about the indications of elderberry and elderflower and I have found no research of any kind that shows either of them to be dangerous in pregnancy. Most conventional medical websites say to avoid them because neither are there studies showing that they’re safe – basically there are very few studies and thus there is insufficient data to concretely say one way or the other. 2. That said, men, women, and children have been using elderflower and elderberries for thousands of years for health and wellness, including childbearing women, so I consider that anecdotal evidence worth noting. From what I know about Slippery Elm Bark is that it can induce miscarriages in pregnant women. Possible folklore? Who knows! I would not chance it. Pregnancy and breast-feeding: Folklore says that slippery elm bark can cause a miscarriage when it is inserted into the cervix of a pregnant woman. Over the years, slippery elm got the reputation of being capable of causing an abortion even when taken by mouth. But there’s no reliable information substantiating this claim. Nevertheless, stay on the safe side and don’t take slippery elm if you are pregnant or breast-feeding. I have elder berries but not elder flowers – is there a significant difference in what the two offer? Would the berries be a good substitute, or should I wait until my new Mountain Rose Herbs order to make these? Please let us know how it goes if you try it! The different forms of elder have different constituents so it might not yield the exact same results, but all parts of the elder are beneficial for colds and sore throats. For instance, the constituents of the leaves are Sambucine (alkaloid), cyanogenetic glucoside (Sambunigrin), Triterpines, Flavonoids (include. rutin and quercetin). The constituents of the flowers are Triterpenes, fixed oil containing free acids, alcanes, flavonoids and the constituents of the berries are Viburnic acid, odorous oil, tyrosin, inverted sugar, tannin, vitamin C and P and J. This is good to know! I love making my own herbal concoctions. If you happen to get a sore throat and need a quick fix without having these ingredients on hand, I love the gaia herb throat lozenges too. I love making slippery elm bark and licorice root lozenges. wow, this is great. thank you! I have not made my own lozenges but I do sometimes gently simmer onion in raw honey or put raw honey, juice of a lemon, and some hot water in a cup when I am sick with a sore throat or feel like I am getting sick. Is it safe to heat the honey? I have heard that putting it in hot water (as is recommended on another post to prevent sore throats) or heating it releases toxins? Is this true? Thanks for your site. I love all that I am learning to make my family healthier! No, it won’t release any toxins – you can definitely heat honey without worry. The one thing that does happen is that by heating raw honey, you denature some of the enzymes so it’s not as beneficial from an antiviral and antibacterial standpoint, but that’s certainly not toxic. Also, honey should never be fed to infants under 12 months old due to their immature digestive systems, but again, it’s not toxic. Just made up a batch of horehound lozenges. I was so pleased at how they came out. At first, anyway. After they cooled I put most of them into a small canning jar. A little later, I noticed they had settled considerably, so, concerned that they might not have cool enough, I emptied them onto a plate and left them overnight. After returning them to the jar, they settled again, even more, and turned into a solid lump. Any suggestions on how to extract them??? Hi, Ann. Let’s see… Did you make the recipe with the slippery elm that’s posted here or the horehound lozenges with the honey syrup that I link to in this post? If you made THIS slippery elm recipe and they settled, it merely meant that they weren’t fully dry when you put them in the jar. I would just try extricating them with a spoon, even though they might come out in pieces. 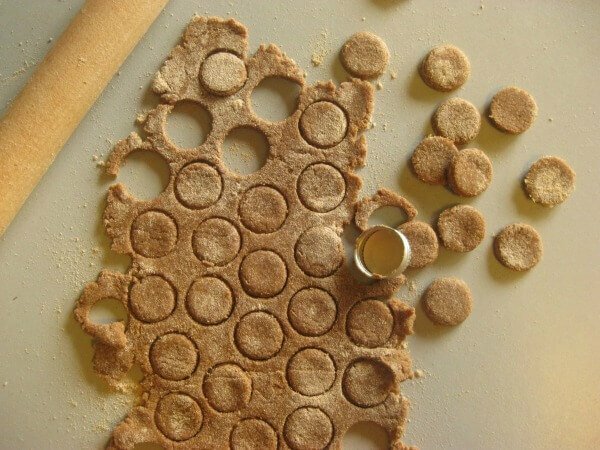 If they’re moist enough, you can try reshaping them, but either way, just leave the pieces out for several days to dry thoroughly or dry them in a food dehydrator. I am definitely going to have to get the ingredients to make these. Thanks so much for sharing the recipe.